Bitterly divided US lawmakers return this week to face a shrinking window for reaching deals on immigration, federal spending and the debt, as Republican infighting swirls and President Donald Trump complains he is getting zero cooperation from Democrats. Trump vowed during his State of the Union address last week to "extend an open hand" to both parties in pursuing an immigration deal that shields 1.8 million undocumented migrants from deportation. But his proposal has been savaged by opposition Democrats, and Trump’s "open hand" soon wagged an accusatory finger. "They Resist, Blame, Complain and Obstruct - and do nothing" to break the immigration stalemate, Trump tweeted a few days after his January 30 speech. Congress has also been haggling over spending caps for domestic programmes and the military as they seek to finalize a budget for the remainder of 2018. But Republican leaders have acknowledged they will not meet a Thursday deadline for a spending bill, and will have to pass yet another stopgap measure this week -- with help from Democrats -- to avoid a government shutdown. 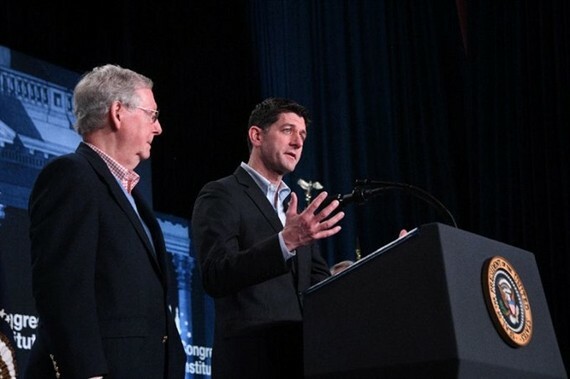 House Speaker Paul Ryan said that while both sides were "making progress" on a budget agreement, a temporary spending bill was necessary to keep the lights on in Washington. "We’re still negotiating the contents and the duration of that," he said. "There’s no education in the second kick of a mule," the Kentucky lawmaker said. With the national debt exceeding US$20 trillion, some fiscal conservatives have signalled they may demand spending cuts in order to vote to raise the limit. In a strongly worded letter to the president, 10 top Democrats warned of "a constitutional crisis" should he use the memo as a pretext for firing the special prosecutor heading an investigation into possible collusion between Trump’s campaign and Moscow. Source from Vietnamnews.